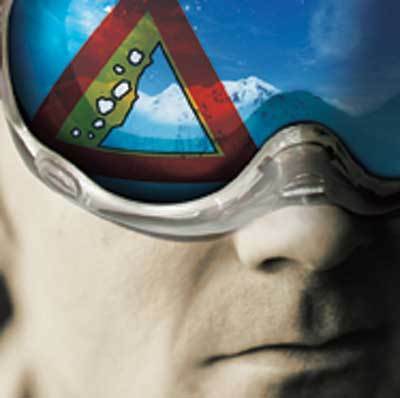 An amazing, sobering look at being stuck inside an avalanche. This skiier was outside of Haines, Alaska. Read the full story here. "This was a decent sized avalanche. 1,500 feet the dude fell in a little over 20 seconds. The crown was about 1 - 1.5m. The chute that he got sucked through to the skier's right was flanked on either side by cliff bands that were about 30m tall. He luckily didn't break any bones and obviously didn't hit anything on the run out. "He was only buried for 4 and a half minutes which is incredibly short. I cannot stress these next sentences enough; that in and of itself to be unburied in ONLY 4:28 is miraculous if you have any understanding of being caught in an avalanche and what it takes to be found. It could literally be some kind of "world record" just on how good the guide and supporting cast of other skiers was in getting to him. It also shows why you should ALWAYS be going with people trained in avalanche rescue / first aid....as well as why you'd want to be going with a guided heli operation. Sure this was terrifying for him, but he would've probably been dead if not for going with a guide." Stalled and shocked by the tragic avalanche through the Khumbu Icefall route, Ed Viesturs and the First Ascent team have been at base camp for about a week, “and that’s probably three days longer than we had originally anticipated.” The group had originally planned their summit push for tomorrow, but a combination of bad weather and avalanches moved in to put them in a “holding pattern.” The next anticipated weather window opens up from the 16th through the 18th. All the teams in base camp are eyeing it hungrily. Stay tuned for more details. Follow the story in daily dispatches, videos, and photos on the ADVENTURE site. Plus, see the mountain up close in a high-res interactive route map. Alpine-style climbing is a preparation game. Gear must be checked and re-checked, camps must be made and stocked on different levels of a mountain, the body must acclimatize to altitude and the mind must steel itself against cold, fatigue and fear. No one knows this better than the men and women preparing make summit bids on Everest. Ed Viesturs and the First Ascent team have spent the better part of a month preparing themselves for the climbing they will do over the next week. Tomorrow, they will leave basecamp and trek directly to camp two where they will rest for a day before continuing on to Camp Three. They plan to arrive at Camp Four (High Camp) on the afternoon of the 11th, then start for the summit on the night of the 12th. If all goes well it will be an Everest sunrise. But that is a big “if” on the tallest mountain in the world. “The mountain decides, ultimately, whether we reach the summit or not,” Viesturs said on his blog. For his sake, let’s hope the mountain is feeling charitable. Mourners at a candlelight vigil in Sparwood, B.C., which lost eight young men to slides. On December 6, 1988, Todd Frankiewicz was on Tincan Mountain in Alaska, making his comeback as a top-notch skier. The previous summer, a serious auto accident had left him hospitalized, and after months of rehabilitation, he felt ready. The day before, he had gone to city hall for a license to marry his girlfriend of nine years, Jenny Zimmerman.